Yes, you can submit it here. It's small. It's fast. It's armed to the teeth. What more could you need? It's about 70 pieces (plus another 10 for the support). I think that it's the first time I have ever used a screwdriver as something other than a screwdriver. Here's a formation of Starhawks coming to the rescue. Should be 20 or 21 pieces not counting the base. 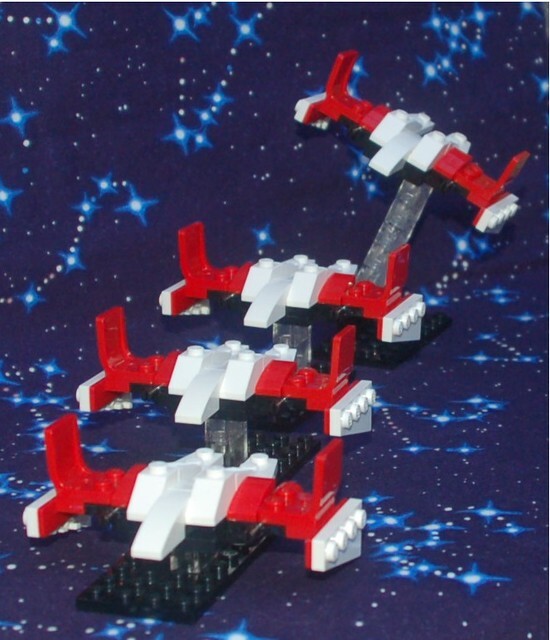 A Formation of Star Hawks, on Flickr. Voting starts now and closes on Monday, April 8 at 11:59pm EST (2 days only). The votes are in and the winner is..... Drumroll..... LEGO Star Wars Mini Chibi Venator-Class Star Destroyer by forum member Talantus. Congrats! That is a really neat little Venator-Class Star Destroyer. The winner will receive three retired LEGO Star Wars polybag sets: 8031 V-19 Torrent, 30247 ARC-170 Starfighter, 30240 Z-95 Headhunter. We will be in touch with you shortly regarding how to claim your prize Talantus. A big thanks to all those who voted for it and especially to the ToysNBricks team for hosting the contest! I'm humbled by the other submissions and the creativity behind original ideas, they are some great looking ships! Toys N Bricks is still working as hard as we can to rebuild the website so that it can be back up to its optimal standard. Whenever we have the time, we will work on it! Congratulations, Talantus, from one competitor to another.